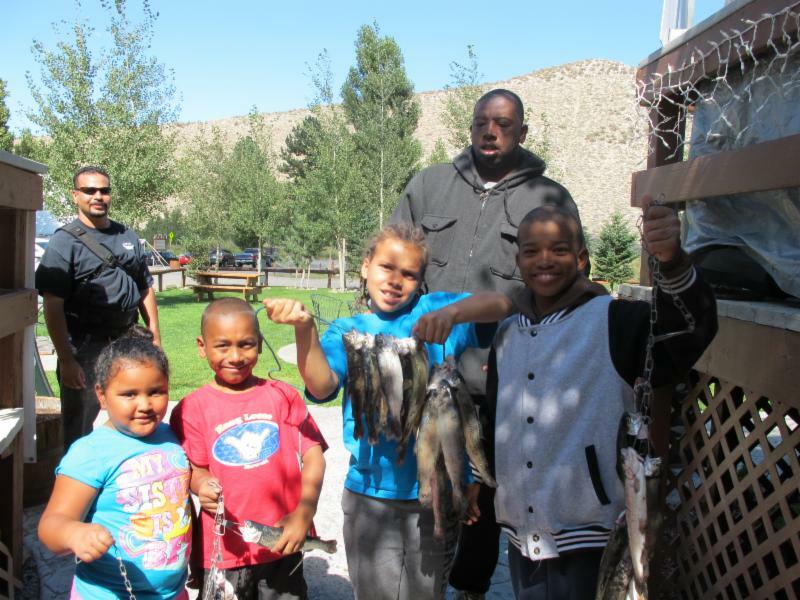 The fishing continues to be good at the lake and creek. I didn't see anything over the 3 pound range this week but there were a lot of full stringers. 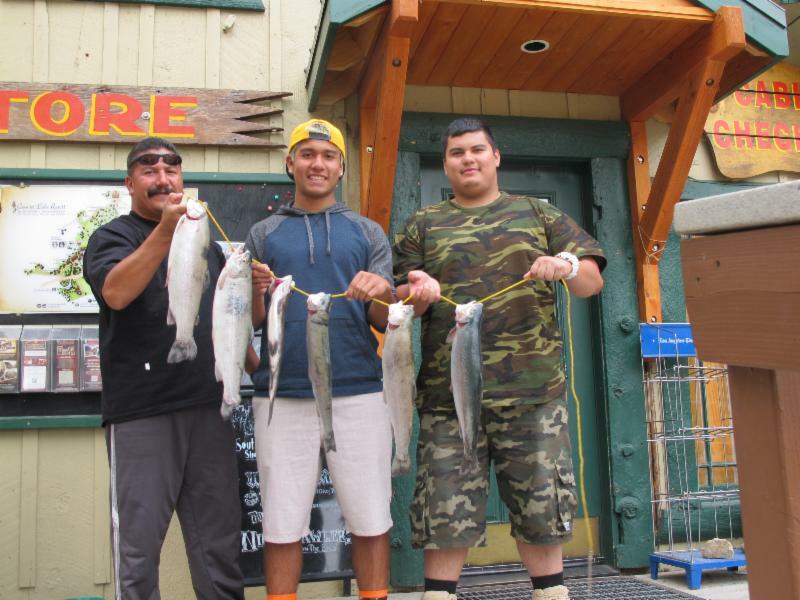 Fall is just around the corner and it is big fish season. It's time to escape to Convict Lake for some fall fishing. I occasionally get requests by email and I've seen people on our social media outlets asking for fly fishing info. They have asked us to post fish that were caught and released by fly. I'd be happy to do this and even add the occasional fly fishing update to the weekly report but I need to get the skinny. 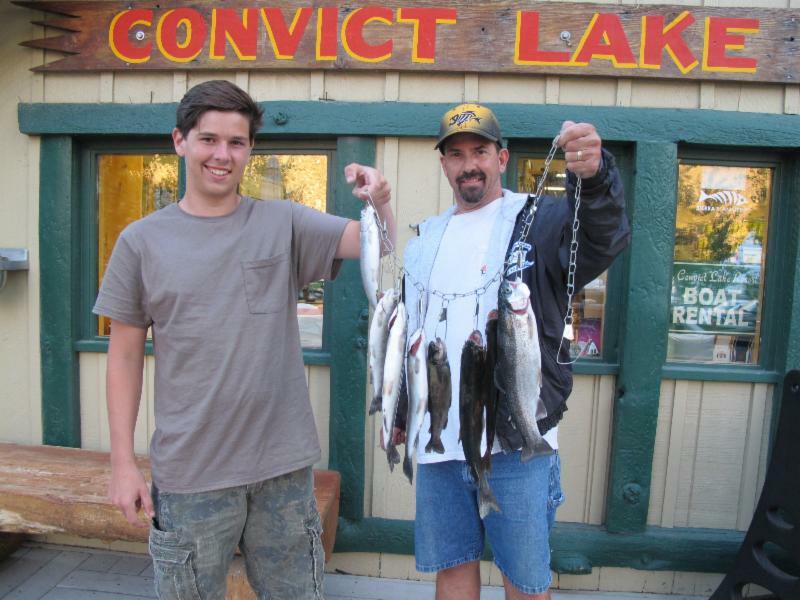 Lake: I would definitely float tube Convict Lake or fish from a boat. From my float tube I'd use sinking line and troll Wooly Bugger (black, brown, olive, or green) or a Hornberg. Maybe add a second fly about a foot behind the streamer like a Pleasant Tail or Hairs Ears. Dry flies would be tough but I'd go with some type of terrestrials (Ant or grasshopper). Especially in areas with bushes like the northwest area of Convict Lake. Creek: I have done well with a dry and dropper when fishing Convict Creek. For the dry fly I'd go with an Adams or Stimulator. For the dropper I suggest flashback Pheasant Tail or my favorite Convict Creek nymph, a Beaded Head Mayfly. Where the water levels are now, I'd have about 3 foot of tippet. This length would change based on the pool or run I'm fishing. I like using my 3 weight 8'6" rod because it's a brushy creek. The section below the campground has a lot of little brown (6-8 inches) which are fun to catch but you will have to work for them due to the terrain. OK all you fly fishermen, please send me your photos and trip reports. I'm looking forward to keeping everyone informed on the fly fishing in Convict Canyon. Catch of the Week: Congratulations to Brooklyn Warmingtom from Los Angeles, CA with three fat fish landed at the beach along the South Shore. 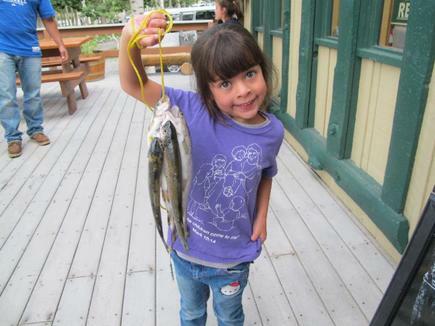 She was using Mice Tails when she scored a 3 pound 11 ounce, 2 pound 8 ounce and 2 pound 4 ounce rainbow. 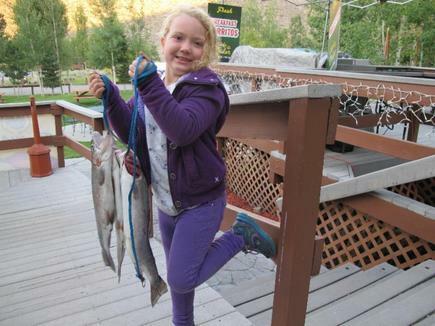 It was a special opportunity for her father to accompany her during these three excellent catches. Great job Brooklyn! 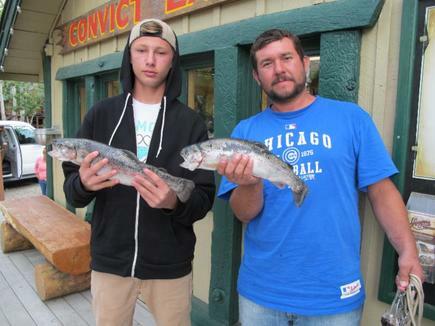 Tactics/Bait: The "go to" lure this week at the lake was once again a Thomas Buoyants. Mice Tails was the lure that landed some fat fish this week. My favorites Mice Tail colors which are similar to the Power Worm colors from last weeks report are pink, red, and orange. In the creek salmon eggs continued to be the hot ticket. The most successful Powerbait colors were yellow and green. The Inlet and South Shore were the hottest spot this week. Other locations fishing well were Hangman's Tree, Jetty and North Shore.